Well, I'd better get this show on the road. I'll be dumping everything that I've found from the HARPS/ELODIE/SOPHIE spectroscopic archives which I think is worth sharing publicly in this thread. I'll be updating this first post over time, so please excuse it looking bare at the moment! I'll try get a first result up by tomorrow, so stay tuned. In the meantime, let me tell you what to expect. If you've seen any of my other analyses, you'll probably be able to tell I try to set them up in a format similar to professional papers, so the post format will be something like an abstract of the result, then a brief overview of the star in question, then an analysis of the spectra, and finally a brief discussion of the system. Just like a real analysis, I will need to look at activity indicators in tandem with the RVs in order to verify signals are planetary, particularly for the small signals detectable by HARPS; the activity indicators I will be using are the bisector width (contraction biswidth) and the full-width half maximum (FWHM), those two specifically because the contrast is not particularly useful concerning the star itself and the S-index is not given by the HARPS DRS. You can find explanations for what the indicators are in some of the HARPS papers, and it's quite boring, so I won't detail how they work here - but in short, both indicators relate to the irregularity of the spectral lines, a "regular" spectrum being where all lines are moved together at the same rate (such as due to orbital motion) while an "irregular" spectrum being where lines are moved at different rates (often due to magnetic activity) - so the indicators are sensitive to the rotational variability and magnetic cycling of the star, should they be present and detectable. The biswidth generally only shows variability of the star, while the FWHM also seems to pick up some instrumental variability, which I will discuss at some point. They are quite capable of determining the nature of RV variability, anyway. So, yeah. Get ready to trawl through pages of me rambling about spectra and planets! Planetary companions more massive than ~10 MJ have proved rare around solar-type stars, which the core accretion model of planet formation implies is caused by the difficulty of planets gaining so much mass from a star's protoplanetary disk. Melo et al. (2007) reported the discovery of a planet with a minimum mass of 20 M⊕ orbiting the G1.5IV star HD 219828 every 3.83 days, and found strong evidence of another planet in the system with a longer orbital period. 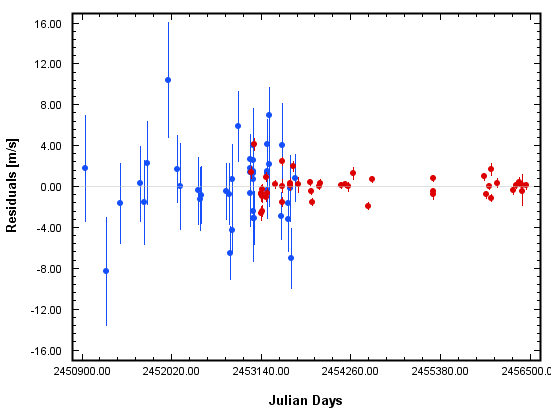 Here I characterise this second companion as an object with an orbital period of 4830 ± 86 days, an eccentricity of 0.812 ± 0.004, and a minimum mass of 14.38 ± 0.14 MJ, making it both one of the most massive and most eccentric companions discovered by RV surveys to date. Assuming the companion orbits at the same inclination as the star's rotational inclination, I find its maximum mass to be 16.68 MJ, which indicates it is a planet rather than a brown dwarf. Combined with the discoveries presented by Marmier et al. (2013), very eccentric giant planets are not uncommon at long orbital periods, which may be indicative of the process that gave them their eccentricities; of the eleven known planets with orbital eccentricities higher than 0.8, seven have wider companions, which suggests Kozai-Lidov oscillations may be the dominant process which produces very eccentric planets. As the radial velocity planet searches reach timescales capable of detecting planets beyond the orbital period of Jupiter, they begin to observe planets which lie at similar separations to where they are believed to have formed, generally between 5 and 10 AU. For surveys such as the AAT-UCLES planet search, this allows them to perform their initial goal of determining the population of "Jupiter analogues", low-eccentricity giant planets that lie at around 5 AU (ex. Wittenmyer et al. (2011)). However, Marmier et al. (2013) presented the characterisation of several high-eccentricity giant planets with orbital periods exceeding 3000 days, some of the first detections in this regime. Since giant planets are expected to form in circular orbits, external processes must be responsible for the high eccentricities of these planets, such as planet-planet scattering or Kozai-Lidov oscillations. Further discoveries in this field will help to determine which process is more common. At the other end of the period-mass diagram, increasing effort has gone into the radial velocity detection of low-mass planets at short periods over recent years. The most successful spectrograph in this endeavor has been the HARPS instrument at ESO, which has led to the detection of several dozen planets with minimum masses of less than 0.1 MJ. The spectrograph continues to find new discoveries, allowing for statistical modelling of the low mass planet population in the solar neighborhood (Mayor et al. (2011)) and a first look into the population of low mass planets in the habitable zones of FGK stars (Pepe et al. (2011)), which approaches the "holy grail" for planet searches of an extrasolar earth-like planet. One of the first low-mass planets detected was HD 219828 b, a "hot neptune" which was announced by Melo et al. (2007). The discovery was based on 22 HARPS radial velocities, which detected a 3.83 variation inconsistent with activity phenomena. 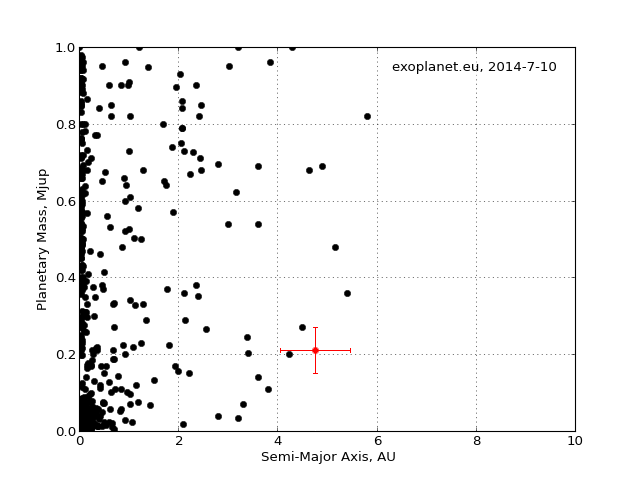 The discovery paper also noted an additional RV variation, indicative of a longer period giant planet. Here, I analyse an extended HARPS dataset to determine the orbit of this outer companion, and find it to be a very massive, eccentric planet. implies the star has a maximum rotational period of 17.6 ± 2.9 days. As Melo et al. noted, Hipparcos found it to be photometrically constant to 0.013 mag. These factors make the star suitable for high-precision radial velocity measurements. Since Melo et al. (2007) announced HD 219828 b, HARPS has continued to observe the star with good short period sampling. The HARPS archive shows that its dataset now contains 92 observations, of which 90 are currently public. Additionally, the SOPHIE archive lists 25 observations, some of which were shown in Bouchy et al. (2013) and 15 are usable. Finally, 4 observations are available in the ELODIE archive, but attempting to include it in-fit indicates that they are not useful. The biswidth and FWHM series for the HARPS data (the SOPHIE values were not included because they do not contribute much to the fit) with γ assumed to be their average value, are shown below with their periodograms. The biswidth series is flat to the measurement error, and its periodogram shows no power with a FAP of less than 5.69, indicating that the star shows no detectable activity in the biswidth. The FWHM series, with exception to a few outliers, shows a moderate linear trend (2.42 ± 0.14 m/s/yr) which is similar in size to many other stars, and is hence probably entirely instrumental. The residuals periodogram with outliers removed shows modest power at 23.21 d (FAP = 0.249), 18.17 d (FAP = 0.624) and 19.11 d (FAP = 0.958), which are reasonably compatible with the inferred maximum rotational period of 17.6 ± 2.9 d. Though it is not clear which peak is the real one, I interpret these peaks as rotational activity and that one of these periods represents the rotational period of the star. Figure 1: series (top) and periodograms (bottom) for the biswidth and FWHM of HD 219828. The biswidth series is constant to the error, while the FWHM series shows a moderate linear trend like many other stars. Figure 2: the periodogram of the FWHM residuals, outliers removed. Some fairly significant power is detected in the range of 18-21 days, which is likely caused by rotational activity. The radial velocity series for the HARPS and SOPHIE data (with γ = -24.1 km/s) is shown below. The shaded area indicates the velocities used in Melo et al. It is immediately obvious that the second companion is much more massive and has a longer period than initially indicated, and that its orbit is considerably eccentric, as it evidently went through a very deep periastron passage during 2007. Figure 3: the radial velocity series for HD 219828. The shaded area indicates the velocities used in Melo et al. : The outer companion evidently went through periastron in 2007, and has not yet completed an orbit in the observational timescale. Figure 4: the periodogram of residuals after fitting the wider companion. 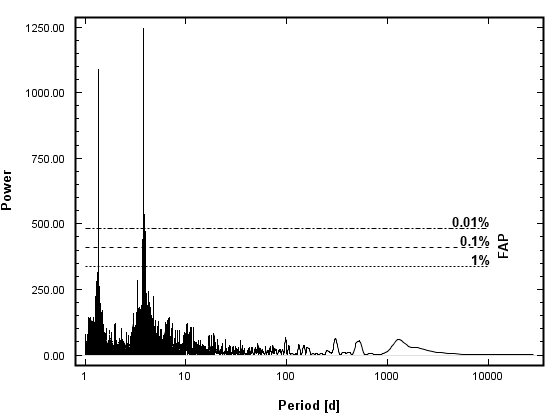 b's signal at 3.83 days and its daily alias at 1.35 days are detected with false alarm probabilities of 1.83*10-14 and 3.11*10-12, respectively. A 2-planet fit converges on orbital parameters of P = 3.8348 d, e = 0.06 and M sin i = 0.062 MJ = 19.6 M⊕ for b and P = 4840 d, e = 0.81 and M sin i = 14.4 MJ for c. A look into residuals periodogram shows a peak 32.09 d with a FAP of 1.3, shown below. Though it is not yet significant, if the signal is real then it may be caused by an ~8 M⊕ planet. It is interesting to note that the periapsis angle of the candidate signal is consistent to that of planet c (140 ± 40° versus 146.0 ± 0.4°); under a planetary interpretation of the signal, this would indicate that their periapsides have aligned due to gravitational interaction between the two. However, b's periapsis angle (225 ± 23°) is not aligned. Figure 5: the residuals periodogram to the 2-planet fit. 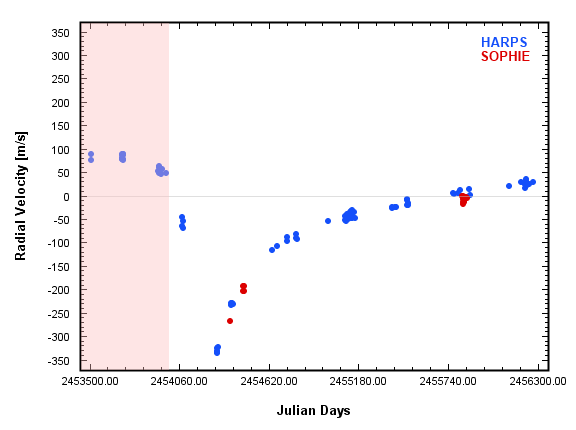 A candidate signal is detected at 32.09 days; though it is not yet significant, it may be indicative of a third companion. The final parameters for the 2-planet fit are listed below. *No matter how much I fiddle with the equations, I cannot figure out how to find semi-major axes. It would probably help if the freakin' equations had units! But yeah, unless one of you can help, I'm gonna have to stick with the values given by systemic. Figure 6: the phased radial velocity curve for planet b (left) and the unphased radial velocity curve for planet c (right). Take note of the scales. , I find the sine of the star's rotational inclination to be 1.32 ± 0.22, 1.03 ± 0.17 and 1.09 ± 0.18 for rotational periods of 23.20, 18.17 and 19.11 days. The first value is impossible, but the second and third values can constrain HD 219828's rotational inclination to be >61° and >66°, respectively. Assuming its planets orbit at the same inclination as its rotational axis, then I find their true masses to be less than 1.149 times their minimum masses: that is, less than 23.9 M⊕ and 16.68 MJ, respectively. As c remains below the "driest" part of the brown dwarf desert at ~40 MJ, it is suitable to refer to it as a planet. HD 219828 is now the eleventh planet with an eccentricity higher than 0.8, the current list in order of decreasing eccentricity being: HD 20782 b, HD 80606 b, HD 4113 b, HD 98649 b, HD 156846 b, HD 43197 b, KOI-1474 b HD 7449 b, HD 22781 b, HD 219828 b and HD 28254 b. Though the current sample is small, it is still meaningful to analyse their statistical properties. Of particular interest is the presence of outer companions, which are implied by the Kozai-Lidov effect to excite the eccentricities of interior bodies which lie at differing orbital inclinations. 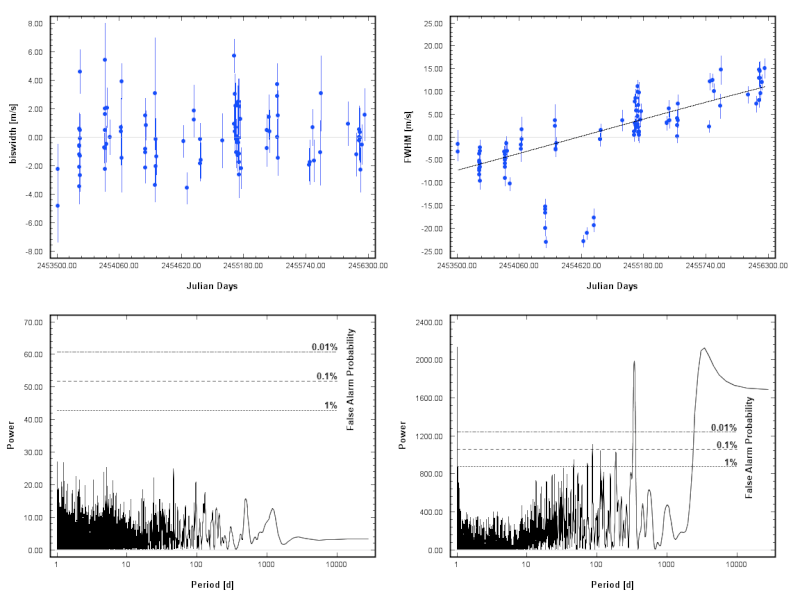 In this sample, four stars (HD 20782, HD 80606, HD 156846 and HD 28254) have wide stellar companions, and three stars (HD 4113, HD 7449 and HD 22781) possess radial velocity trends indicative of companions beyond the orbit of the planet. Of the remaining stars, KOI-1474 has an exterior planet which does not seem to capable of exciting b's eccentricity (Dawson et al. (2014)), and HD 43197, HD 98649 and HD 219828 do not currently show any evidence of exterior companions. This suggests 7/11 of the planets in the sample may have had their eccentricity excited by the Kozai-Lidov effect, which indicates the process may be the dominant method of producing extremely eccentric planets. HD 219828's lack of exterior companions would therefore be somewhat surprising, but it is important to note that the star has not, according to literature, been searched for stellar companions by imaging, and the radial velocity series is not long enough to determine whether the star shows a radial velocity trend. HD 219828 represents a unique conjunction of the two current endeavors of radial velocity planet searches, the discovery of short period low-mass planets and long period giant planets. I find indications that there may be a third planet with an orbital period of ~32 days, which may be confirmed by continued observations. An extended time series may also reveal a radial velocity trend, which would be indicative of a wider companion that may be responsible for c's remarkably high eccentricity. Attempts to image a stellar companion to the star may also reveal such a companion. Either way, HD 219828 is a system deserving of further observation. That was a very interesting read! Thanks! I'm a little confused about the behaviour of the FWHM. You state that the ~linear trend is likely instrumental. What on the instrument would be causing the FWHM to increase over time? Degrading optics causing a change in focous of the spectrum on the CCD? And where do you actually find the public HARPS RV data? (It might also be worth making separate threads for different systems, to help keep work organised). You state that the ~linear trend is likely instrumental. What on the instrument would be causing the FWHM to increase over time? Degrading optics causing a change in focous of the spectrum on the CCD? Honestly, no idea. I've observed it in most of the stars where I've made a series out of the FWHM: it's always positive, but its magnitude varies (between ~0.5 and ~4.5 m/s/yr). Its magnitude appears to be correlated with either the Teff or log g of the star, but I'm not sure which yet, so I'm gonna hold onto that until I get more points on the relation. With that in mind, it might have something to do with HARPS' ThAr reference spectrum? Here. I'll start making a tutorial on how to use it today. Also, the ELODIE archive is here and the SOPHIE archive is here; how to use these two is more obvious, but I'll still probably make a tutorial. I'm gonna put a "contents" thing in the top post, which should keep things clear. Also gonna explain a few other things up there. Do you do your own error propagation calculations or have you gotten Systemic to determine error margins on the various orbital parameters? The errors on period, mass, eccentricity and argument of periastron are done with systemic's bootstrap, but where the solutions show multiple modes where one is clearly preferred I estimate the "real" value with the scatter plot function (I believe I did that for b here). Semi-amplitude and semi-major axis are derived by adjusting to the most extreme relevant parameters (P and e for K, P for a) and then taking the values from the planet box. I just realised that I didn't include the error on the stellar mass in the error on the planetary masses… going to fix that. Well, Sirius' extractor thing has given me reason to look at several systems on my radar, but it's time to get back to this! Again, this is a system that I have noted before (in the image link), though as a quadratic trend. The recent extension to the HARPS series greatly constrains the orbit of the companion, which I describe here. As the observational timescales of the high-precision radial velocity planet searches extend beyond a decade, we are beginning to observe long-period companions with orbital semi-amplitudes similar to Saturn (2.7 m/s), and thus approach the characterisation of the population of sub-Saturn mass planets at separations of several AU. 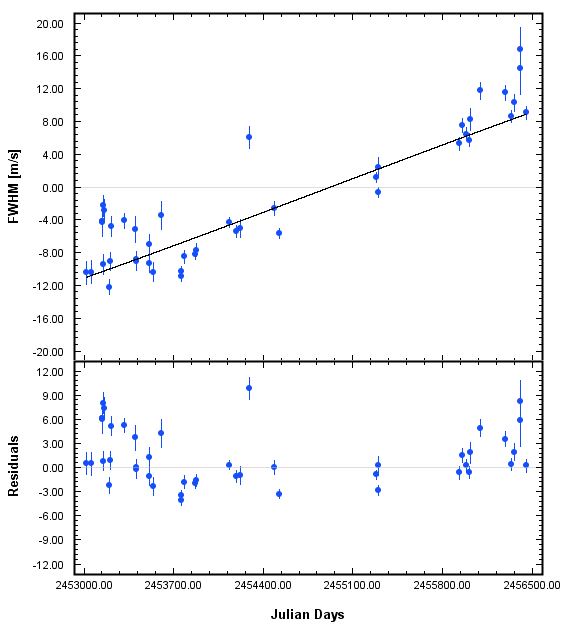 Here I report the detection of the first such planet orbiting the G4V-IV star HD 102117, which was itself previously discovered to be orbited by a sub-Saturn on a 20.8-day orbit (Tinney et al. (2005), Lovis et al. (2005), Butler et al. (2006)). The parameters for this new companion are currently somewhat poorly constrained; I find it has an orbital period of 3700 ± 800 days, an eccentricity of 0.22 ± 0.26 and a minimum mass of 0.21 ± 0.06 MJ. The rotational inclination of the star is calculated to be 34 +46-21 degrees, which would imply that the true masses of the companions are 1.79 +2.80-0.77 times larger than their minimum values under the assumption that their orbits are aligned with the rotational axis of the star; however, this result is based on a questionable estimation of the star's rotational period and thus should not be taken with confidence. The nature of the system is further discussed. Since the turn of the millenium we have seen a great shift in the mass domain detected by radial velocity planet searches. The discovery of the first planets smaller than 0.1 MJ (~30 M⊕) are now just short of ten years old (Santos et al. (2004), McArthur et al. (2004), Butler et al. (2004)) and the discovery of the first planet smaller than 10 M⊕ is only one year younger (Rivera et al. (2005)). These extensive observational surveys have found that low-mass planets are astonishingly common around solar-type stars (ex. Howard et al. (2010), Mayor et al. (2011)) as well as around M-dwarfs (ex. Bonflis et al. (2013), Tuomi et al. (2014)). A side effect of these vigorous searches for low-mass planets is that, as their observational timescales extend towards and beyond a decade, they begin to probe planets of moderate masses (0.1 - 0.5 MJ) at separations of several AU, a region which has not been previously detectable. Characterisation of this region is in its infancy due to the difficulties of detection significance, but the first cases are promising (ex. 83 Leonis Bc (Meschiari et al. (2011)), HD 215456 c (Mayor et al. (2011)), HD 85390 c (Wittenmyer et al. (2013), in prep.)). In this work, I present the discovery of the smallest planet in this regime yet. This planet orbits the star HD 102117, where Tinney et al. (2005) discovered a sub-Saturn mass planet with an orbital period of 20.8 days. The companion described here lies at a much wider separation, but is similar in mass to the inner companion. HD 102117 has previously been found to be a super metal-rich mid-G star. Tinney et al. (2005) found the star lies above the main sequence, but their mass of 0.95 ± 0.05 M☉ implied that the star has an age of >10 Gyr, which is incompatible with its membership in the thin disk (Adibekyan et al. (2012)) and its high metallicity. My compilation of HD 102117's parameters are listed in the table below. Using the spectral parameters of Sousa et al. (2008) and the PARAM interface, I find more reasonable values for the star's mass (1.055 ± 0.014 M☉) and age (7.087 ± 0.735 Gyr). Though the star is not quite on the subgiant band, it is still significantly evolved, leading to the observed strong constraint on its isochronal age. The evolution of the star also entails a low level of activity, which is corroborated by its log RHK (-5.053; Lovis et al. (2011)). The low v sin i of the star sets a fairly poor constraint on the maximum rotational period of the star (<67.8 +89.2-25.5 days), which is consistent with the value predicted by its log RHK (37.9 ± 3.9 days; Lovis et al. (2011)). To summarise, HD 102117 is an inactive, metal-rich, moderately evolved G-type star. Since the publishment of Lovis et al. (2005), HARPS has continued to observe HD 102117 fairly regularly. The archive lists 66 observations, of which 55 are public. I choose to exclude the observations from BJD 2453207 (2004-07-20) because they have short exposure times, giving them poor S/N values. This leaves the HARPS dataset with 45 observations, with an average RV error of 0.47 m/s. The most recently published AAT dataset for HD 102117 comes from Butler et al. (2006). The series has no significantly discrepant values, and the average RV error is 3.2 m/s. The HARPS biswidth series and its periodogram is shown below. A trend is visible to the eye, though it has fairly poor periodogram power and lies below peaks at 1.415 and 3.380 days. All of these peaks turn out to be aliases, and since the shorter period peaks are not expected for a quiet star I intepret the long period power as the real one. Fitting shows it is indeed not a high S/N detection, but a bootstrap finds it highly significant (-0.22 ± 0.04 m/s/yr; 5.5σ). This is likely indicative of a very long (>10000 day) magnetic cycle; such long cycles seem to be unique to either inactive or evolved stars, both of which apply here. 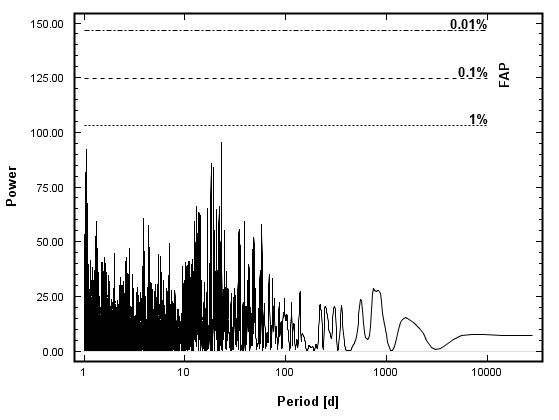 The periodogram after removing the trend is displayed in figure 2, which shows no peaks distinct from the noise floor. Figure 1: series (left) and periodogram (right) for the HARPS biswidth. Though the trend is not formally significant in the periodogram, fitting it indicates it is real. Figure 2: the linear fit to the biswidth series (left) and the residuals periodogram (right). The FWHM dataset shows a clear trend, which is definitively detected in the periodogram. Fitting it finds dF/dt = 2.24 ± 0.15 m/s/yr, which is slightly smaller than expected from its Teff (~2.9 m/s/yr; see figure 4). This indicates it is being suppressed by the trend observed in the biswidth, but as they are both linear it is not possible to directly disentangle them. Thankfully, Lovis et al. (2011) developed scale factors for the amplitudes of magnetic cycles between different spectroscopic observables, by use of correlations scaled by log RHK. Though the S-index and, in turn, the RHK of a HARPS spectrum is not derived by the DRS, the scale factor between log RHK and the biswidth can be used to the same effect. Using equation 12 of Lovis et al., the scale factor between log RHK and biswidth for HD 102117's Teff and Fe/H is 24.91 ± 1.66, so the magnetic trend in terms of log RHK is (-0.22 ± 0.04)/(24.91 ± 1.66) = -0.0088 ± 0.0022 units/yr. Equation 9 gives the scale factor between log RHK and FWHM, which is 76.56 ± 4.24; thus, magnetic trend in terms of FWHM is -0.22 ± 0.04 * ((76.56/24.91) ± ((72.33/23.25) - (80.80/26.57)) = -0.68 ± 0.13 m/s/yr (note that, due to the combination of the constant(ish) Teff and Fe/H by these equations, the scale factors are smallest when the RHK trend is smallest and vice versa). Therefore, the magnetics-corrected FWHM trend for HD 102117 is 2.92 ± 0.28 m/s/yr, which is in better agreement with the expected value. After removing the FWHM trend, the residuals show indications that the summated variation is non-linear. This is not an expected behaviour for the FWHM trend, so it likely corresponds to some additional variation. A quadratic trend provides a reasonable fit to the data, and the residuals show no additional variation. Though I cannot explain what causes the additional variation (let alone what causes FWHM trends anyway), I have observed a very similar effect in an almost analogous star to HD 102117 (which I decline to name here due to its interesting RV variations), so it may be related to the lower surface gravity of the star or some other parameter which makes it distinct from stars which do not display this behaviour. Figure 3: HD 102117's FWHM series and its periodogram. The FWHM trend is confidently detected, but is somewhat smaller than expected. Figure 4: My current sample of FWHM trends as a function of Teff between 5500 and 6000 K, with a quadratic fit to the greater dataset (4900-6300 K). HD 102117's raw value (2.24 ± 0.15 m/s/yr) is shown in red, and its corrected value (2.91 ± 0.36 m/s/yr) in green. The correction is noticeable, but does not much compare to the largest outliers to the relation. Figure 5: The modeled FWHM and its residuals. The shape of the residuals indicate some additional trend-like variation, but other than that there are no significant peaks in the residuals. 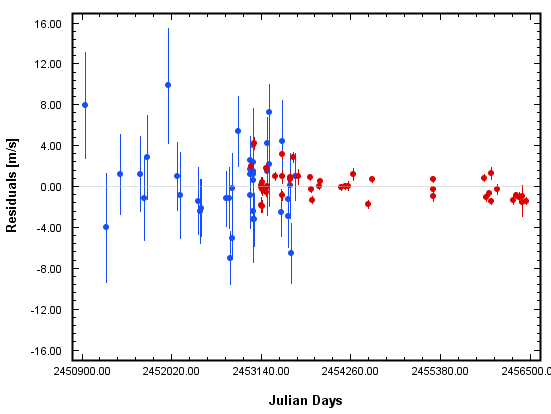 Figure 6: HD 102117's radial velocity series and periodogram. b's signal is very clearly detected by the periodogram, with a FAP of 2.89*10-12. In the interest of testing its significance by other means, I attempted to model it the variation as a sinusoid. This shows the signal has an F-test of 0.49, indicating it is not significant. However, I suspect this low value may be due to the combination of two datasets of significantly different levels of precision; the signal has an amplitude comparable to the rms of the AAT data which dominates the rms of the combined dataset, but the signal is quite visible in the HARPS data. Thus, I tried the 1-planet fit with the HARPS RVs only. This again shows a long-period variation to higher significance (FAP = 1.3), which is likely not higher because of the small dataset (n = 45). However, fitting it as a sinusoid gives it an F-test of 0.03, indicating it is actually of recognisable significance. Though perhaps not as significant as would classically be required to consider the signal real, I believe it is convincingly not random noise. As no counterpart in at least the biswidth is noted (the FWHM behaviour is probably not due to the star), it is likely caused by a planet. A 2-planet fit gives P2 = 2900 d, e2 = 0.11 and M2 sin i = 0.17 MJ, while not changing the parameters of the inner planet much. Figure 8: The residuals to the 2-planet fit. The HARPS data appear to show a minor downwards trend. While certainly not formally significant, because it is a negative change it is likely the imprint of the magnetic trend on the radial velocities. Returning to Lovis et al. 's scale factors, equation 9 gives the RHK - RV scale factor of 34.45 ± 2.60, so the magnetic trend in terms of RV is -0.22 ± 0.04 * ((34.45/24.91) ± ((31.84/23.25) - (37.03/26.57)) = -0.30 ± 0.06 m/s/yr. The a priori trend observed in the RVs is -0.31 ± 0.17 m/s/yr, so this result is consistent with the trend being entirely magnetic. Including the trend adjusts the parameters of the outer planet to P2 = 3700 d, e2 = 0.18 and M2 sin i = 0.21 MJ, and also reduces the χ2 from 5.66 to 4.68, indicating the trend provides a real improvement to the fit. Though it is important to note that this assumes the magnetic trend is linear over the entire dataset (which is not known because UCLES does not have any activity indicators), the low precision of the AAT data prevents this from having any strong bearing on the fit. The 2 planets + trend model seems to be a sufficient model to the radial velocities, as the residuals finally seem to be flat and the periodograms show nothing above the noise floor. Signals with amplitudes of ~2 m/s or larger would be noticeable at periods smaller than that of the outer planet, which places constraints on the presence of additional companions down to the low-mass regime. Figure 9: The 2-planet + trend residuals. To be compared with figure 8. 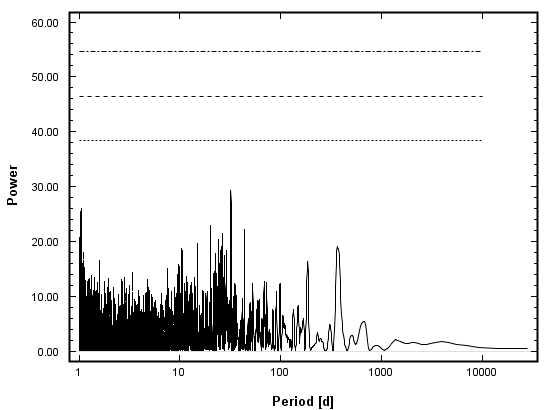 Figure 10: The residuals periodograms for the entire dataset (left) and for only the HARPS data (right). Nothing is particularly noticeable, so there do not seem to be any more detectable signals in the data. The final parameters for the system are listed below. The error on the trend is accounted for by bootstrapping orbital parameters given a fixed fixed values for the trend; first the mean, then the extremes of the 1σ bounds (i.e -0.30, -0.24, -0.36 m/s/yr). The agglomerated result are presented below. Figure 11: (left) the phased velocity curve for b and (right) the unphased curve for c on differing scales. Though both planets have fitted eccentricities, neither of them are significant. Figure 12: A portion of the semi-major axis - mass diagram, with HD 102117 c shown in red. Error bars for the other planets are not shown for clarity, but in the region including c the error bars are comparable. Almost all of the planets in the vicinity of HD 102117 c are microlensing detections. The closest radial velocity detections to c's location are HD 85390 c (whose source is questionable with the data previously at hand, as I have previously noted), HD 10180 h, 83 Leonis Bc and HD 215456 c, all of which are either higher mass or smaller separation; thus, HD 102117 c is the smallest radial velocity detection in the ever-extending "frontier" of increasing detections at wide separations. The HD 102117 system appears to be fairly typical for a system with multiple giant planets; one hot companion, and one cooler one. This architecture is similar to those observed in Hot Jupiter systems with another planet such as HD 187123 or HAT-P-17, which are arbitrarily distincted from tighter systems such as Upsilon Andromedae or HIP 14810 by a period ratio exceeding 100. However, it is crucial to recognise that HD 102117 b does not fall into the "clump" population of Hot Jupiters with semi-major axes of ~0.05 AU, which likely reflects some difference in the planet's migration history. One can posit that either b was "late" to undergo type II migration so that the disk dissipated before it reached the clump, or that the disk interior to ~0.15 AU was already cleared out by the time b reached it. More detailed modeling of these scenarios is outside the scope of this work. The migration of b would have significantly or totally disrupted the disk between its location of formation (~5 AU) and its current location (0.15 AU), making it unlikely that any other planets lie in this region. Ergo, any additional planets in this system should lie either interior to b (where strong limits can already be placed) or exterior to c.
As b would have totally cleared the disk at the location of its formation, if c were to have migrated in from a somewhat wider separation (~10 AU?) at a point significantly later than the migration of b, then it would have been stopped at a location somewhat exterior to the initial semi-major axis of b. c's current location at 4.8 ± 0.7 AU is not incompatible with this hypothesis, and may even require it, as there might not have been enough material to form both b and c in the region 3-5 AU. and the previously given values for Prot, v sin i and R*, I obtain sin i* = 0.56 ± 0.38, and thus i* = 34 +46-21 degrees. Using this as the system orbital inclination means that the true planetary masses are 1.79 +2.80-0.77 times their minimum values, namely Mb = 0.28 +0.47-0.13 MJ and Mc = 0.38 +0.86-0.23 MJ. While certainly not well-constrained, the maximum masses (0.75 and 1.24 MJ, respectively) indicates that the planets are typical Jovian planets, which show a mass pileup at around 1 MJ. Even if the planets are at their maximum masses, it would not change the previous hyptheses much. But even now, there is an issue with this result. The value for the rotational period of the star comes from a log RHK - Prot calibration, and is thus not an observed value; while this calibration produces good results for dwarfs (ex. HD 40307: prediction = 47.2 ± 5.3 d, observed = 43 d), it seems to fail significantly for either very inactive or evolved stars, though I am not sure which (ex. Delta Pavonis: prediction = 41.4 ± 3.9 d, observed = 21 d), both of which apply here. Though the predicted period for HD 102117 does seem quite plausible, it should be taken with suspicion. As a final note on this system, it is interesting to point out that the star's observational series is not particularly remarkable; n = 45 is fairly normal for a HARPS-GTO star, and is a far cry from the several hundred observations that most of the announced low-mass planet hosts have. This indicates that detecting a planet like HD 102117 c is quite possible even for a modest dataset, which then leads to the inexplicability of why c is currently so isolated on the A-M diagram. It is possible that similar detections may appear in the following years, but another possibility is that long period sub-Saturns are rare, consistent with the rarity of such planets at short periods (Mayor et al. (2011)). Indeed, considering that the star's inclination indicates that the mass of the planet is somewhere around twice its minimum value, it may not even be such an unusual planet. What do you do when your bootstrapping gives you things like NaN? Kinda depends. I pretty much only ever use the 68.7% (1σ) interval, which should really always converge for a properly detected signal, though it might find NaN for the argument of periapsis. If you do get NaN for the 68.7% confidence value for something other than the periapside, the signal being fitted is probably not significant.